Fish nuggets are portioned, breaded & fried pieces of fish fillet (for example cod or pollack). 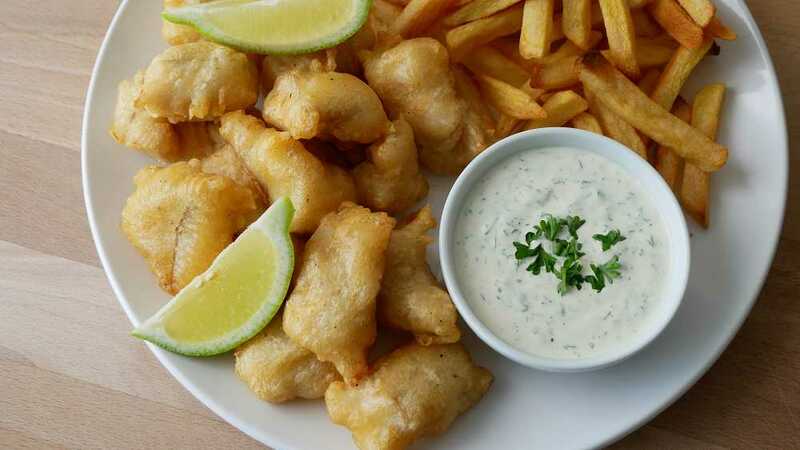 The fish fillets are cut into bite-sized cubes, then turned into a beer-batter & finally deep-fried in plenty of oil until golden brown & crispy. Finely chop dill & parsley & add to a small bowl. Stir together chopped herbs with 125 grams mayonnaise & 125 grams yogurt, then season well with salt & pepper to taste & set aside until serving. Put 125 grams of flour, 75 grams of cornstarch, 1 heaping teaspoon baking powder & a good pinch of salt & pepper in a mixing bowl and mix briefly. Add 200 milliliters beer & stir together with a whisk or blender until a lump-free & viscous batter. Cut pollack or cod into bite-sized cubes. Heat up a large pot or wok adding 1 – 1½ liters of oil for deep-frying (the oil is hot enough, if you dip a wooden stick into the oil & immediately small bubbles arise). 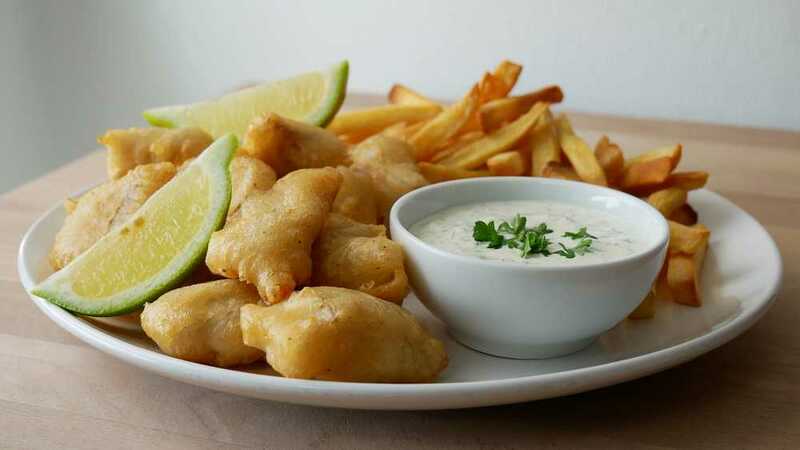 As soon as the oil is hot enough, use a fork to pull the fish cubes through the prepared beer batter, allow the excess batter to drip off a bit & then fry until golden brown for about 5 minutes, turning occasionally.